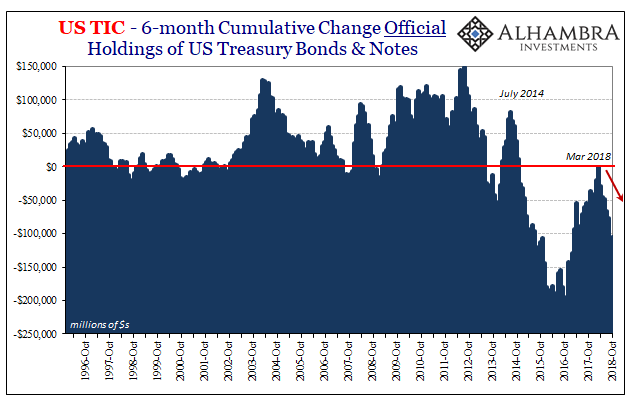 The US Treasury Department’s update of its Treasury International Capital (TIC) report for October contained no surprises. In many ways, it was ironically uninteresting given the constant excitement that had happened during that particular month. It was, in a word, a mess for global markets.  Liquidations struck throughout the world and more than a month later we are still struggling through the consequences. A worldwide global liquidity pullback like that has led to “selling UST’s” by foreign central banks. 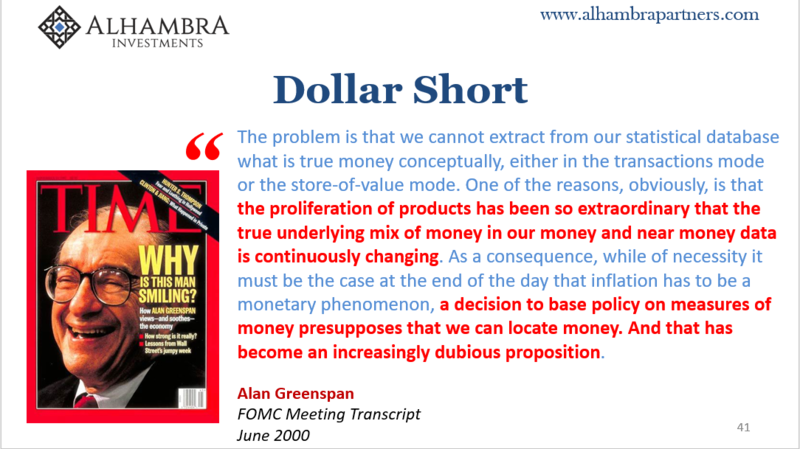 Foreign systems require dollars no matter what (dollar short) and if the eurodollar system won’t make available a reasonable supply (dollar shortage) the options for any overseas system is either liquidation or support. Often some of both. Foreign Official Institutions (FOI) have at times tried to fill in some of the gap, especially over the last four years. The reduction in foreign reserves particularly US$ assets primarily Treasury securities has been pronounced. Unsurprisingly, the TIC data shows another big global drawdown in October. At more than $40 billion, the decline was nearly as bad as April, also consistent with turmoil in markets. These are months more like 2015 than 2017, and it showed in the financial system and is beginning to show in the real economy. 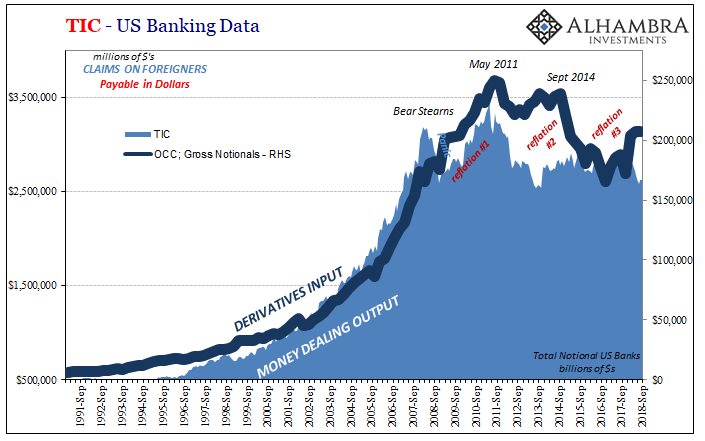 China was, as usual, a primary culprit as another predictable outcome – also considering that they practically warned the world during October (RRR). 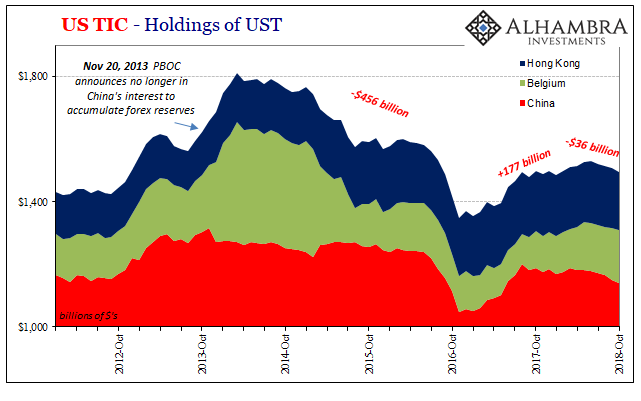 Chinese official holdings of “reserves” have started to fall off once more, reflecting the reversal of conditions in the world’s reserve currency system (eurodollar not dollar). 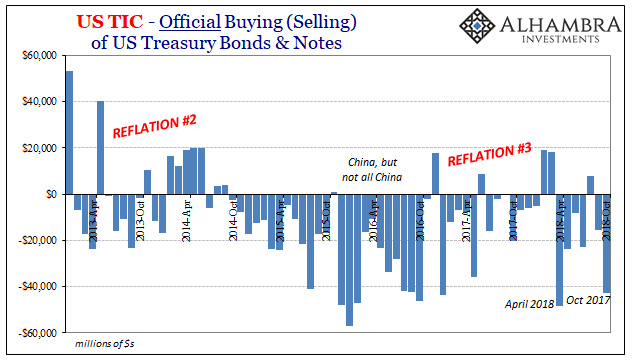 Like any of the Federal Reserve or ECB’s extraordinary and emergency monetary policies that they came up with during the last decade, selling UST’s obviously hasn’t proven to be very effective. Instead, all it tells us is what’s going on in the shadows; if a central bank feels compelled to intervene in any way, that indicates there is serious dysfunction so as to grab their attention and force a response. It is strictly an alarm or another proxy rather than a solution. The reason for it is how the modern global monetary system actually works. Economics since the seventies has left a void in our as well as their understanding of money, down to its most basic functions. This has meant an incredibly blinded picture of the banking/money system across several decades of just massive innovation and transformation. Each textbook starts with a premise that glosses over all the pertinent details. 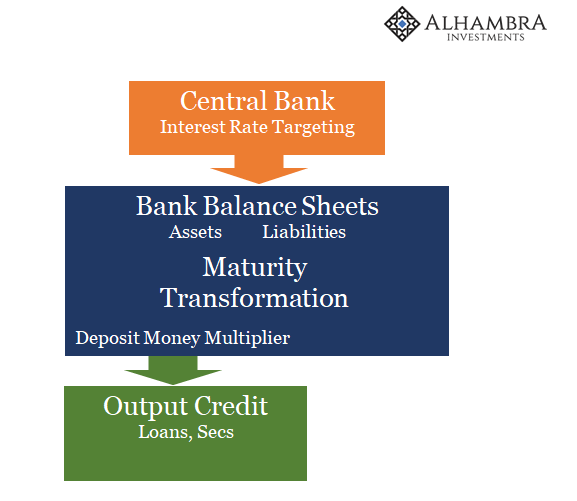 We are taught that banks operate on the basis of maturity transformation; they borrow funds at a short-term rate and then lend those funds at longer maturities profiting from the spread between short and long. Monetary policy under this arrangement seems very easy. 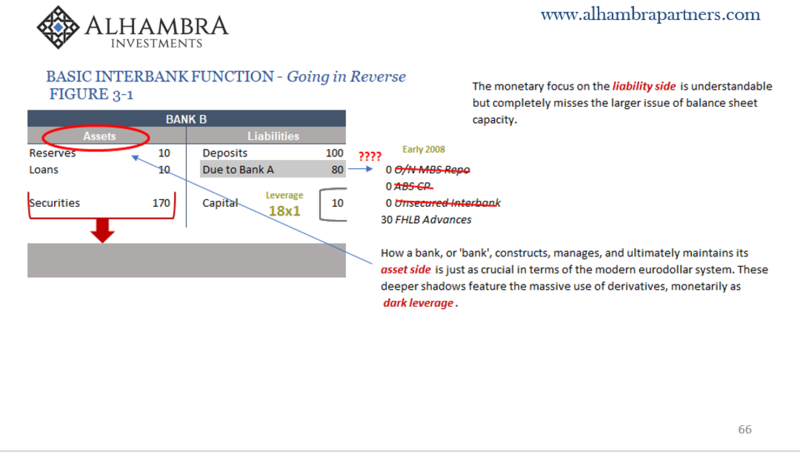 Increase the short rate and reduce the profit potential, all else equal, for banks. 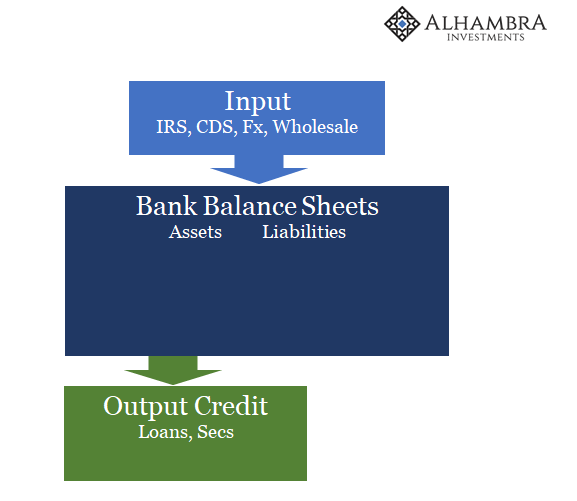 There is by design less credit output as a consequence. Stimulus would be equally simple, done in reverse. Except, this is not how the banking system actually operates. The money market rate is but one input among a whole long list of them and it isn’t even an important one. 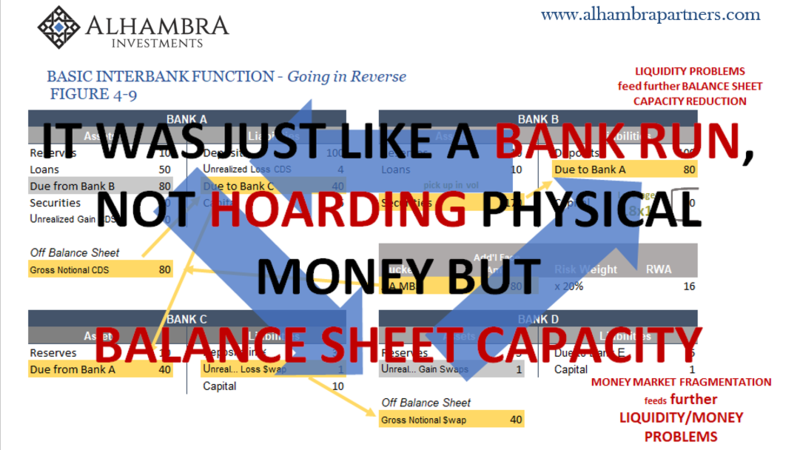 Not how the modern bank, which operates more like a hedge fund, puts itself together and builds out its balance sheet. People often ask the question why there are so many derivatives. There are hundreds and hundreds of trillions in gross notional contracts outstanding, an incomprehensible level which doesn’t seem to serve any legitimate economic purpose (except to scare everyone). And that’s true, if you only view these derivatives from the perspective of Economics and simple maturity transformation. But like everyone misunderstood credit default swaps ten years ago, derivatives are the stuff of balance sheet construction. CDS were described in the mainstream as misguided insurance or hedging tools and that was true in a technical sense. The way they were principally used, however, was for something called regulatory capital relief. In short, they were an input for banks to be able to flexibly, predictably, and most of all efficiently design their balance sheets. 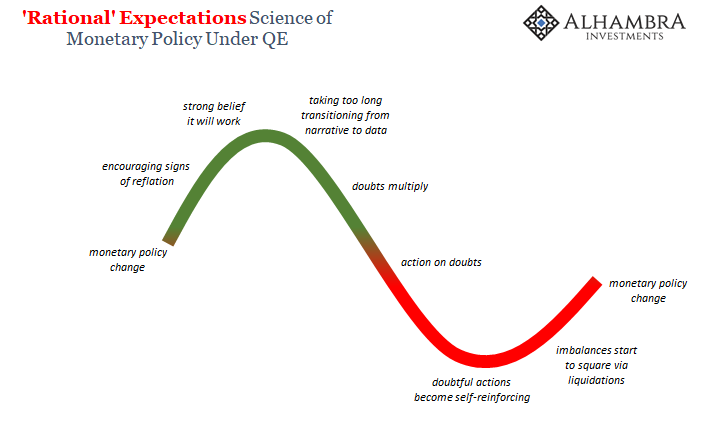 This was a central focus of both Eurodollar University Season 1 and especially Season 2. 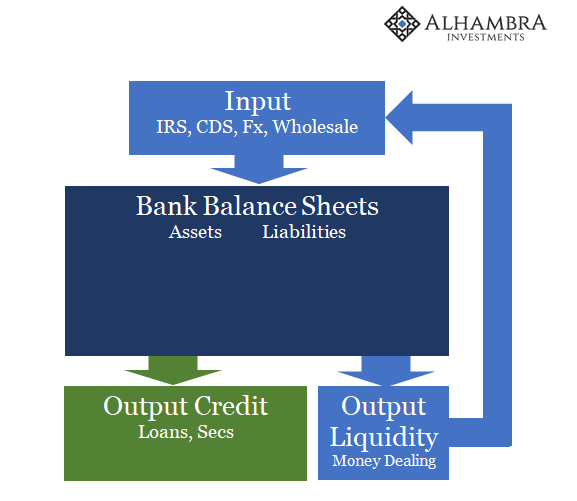 One of the major problems with this arrangement is where those derivative (or wholesale money) inputs come from. They don’t come from the Federal Reserve, ECB, or PBOC. When complex systems are thrown together in organic evolution, self-dependence is often the result. 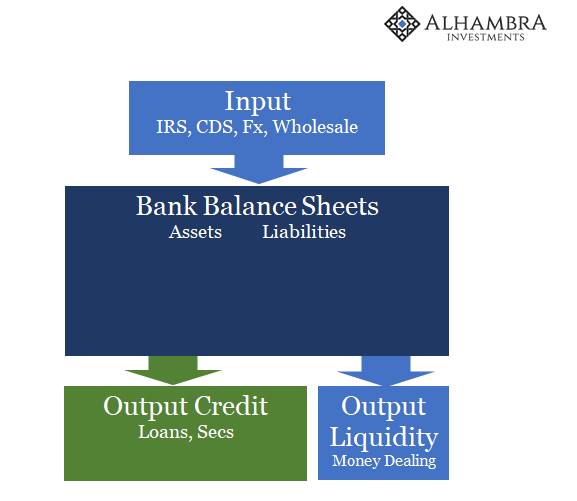 The global eurodollar system not only outputs credit from its balance sheet machinations it also throws off liquidity in these money dealing capacities, the very things that are taken as inputs. It is therefore an incestuous framework where, not quite perpetual motion, the system requires from itself the things that keep the system going. So long as everything was growing often quickly, it appeared to be riskless to those participating in it. Like a spinning top, the faster it went the more stable it seemed to be; only in this case, for momentum to be preserved to keep the whole thing spinning rapidly, the top (banking system) needed energy from itself to keep itself spinning at a sufficient rate. What is a central bank to do given this situation? The honest truth is that none of them know what to do. They don’t even understand how this works because it had been deemed an off-limits topic as a result of the missing money seventies. In reality, central bankers crossed their fingers this deep monetary ignorance wouldn’t matter. This is where Greenspan’s legacy was so harmful – and remains so to this day as people don’t understand why 2018 is turning out like it has. 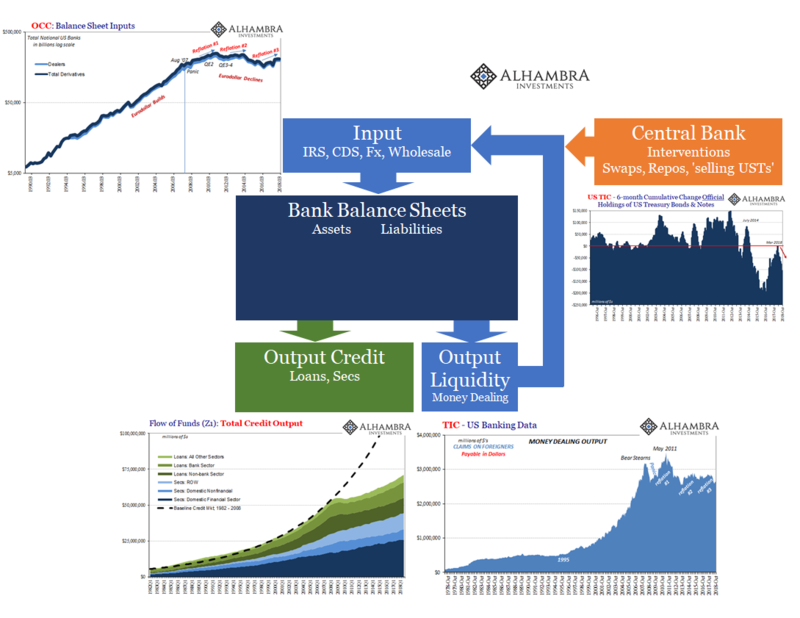 Since the central bank isn’t central, what we are left with is monetary officials on the outside attempting to get in deploying tools that weren’t designed for modern balance sheet usage. 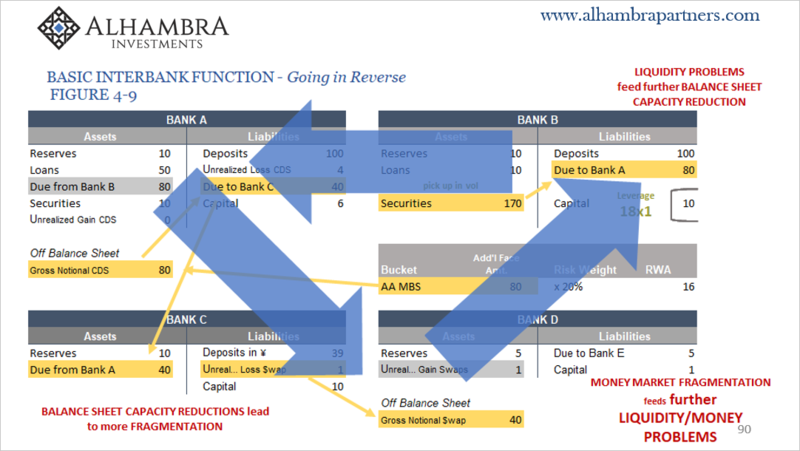 Bank reserves, for instance, the primary byproduct of LSAP’s like US or European QE, are just one form of inert liability that doesn’t accomplish much in the way of balance sheet construction. 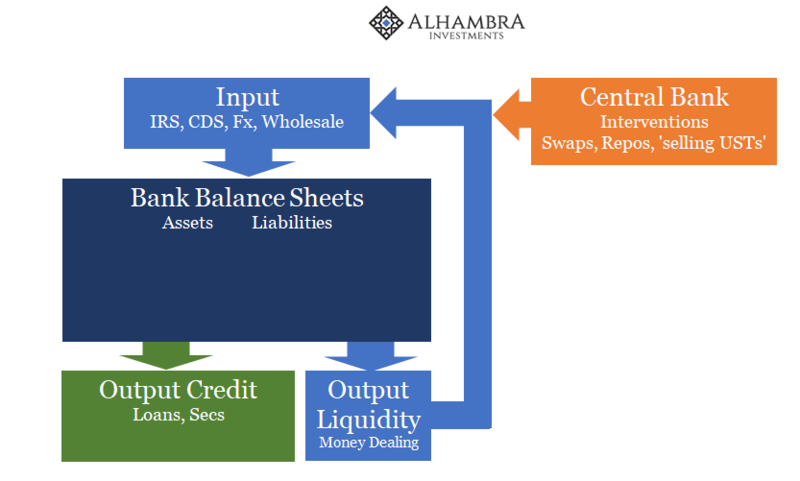 At most, something like QE or selling UST’s (in an overseas situation) can help with a very small (I would argue inconsequential) subset of faulty balance sheet mechanics. 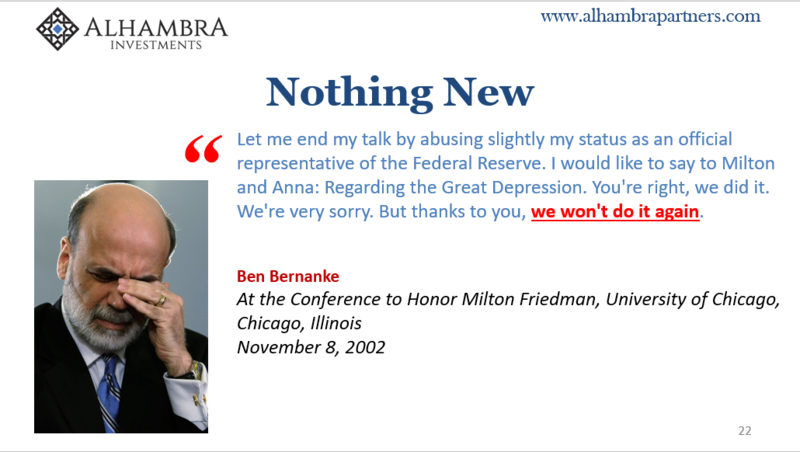 I’ve often written over the last decade that about the only thing the Fed might’ve done differently that could’ve had a prayer of succeeding (even though still small probability) was if instead of taking over some of AIG’s assets (Maiden Lane II and III) it much earlier in the crisis substituted itself for AIG – in securities lending as well as CDS. That would’ve required something greater than a bailout, meaning a far larger commitment that even guaranteeing all of AIG’s CDS contracts then in existence – good and bad. In other words, the Federal Reserve perhaps should’ve become AIG; replicating all its money dealing functions especially in these derivative inputs. Obviously, that was never going to happen. There was and is no legal authority in large part because central bankers therefore politicians are so far behind the times. They didn’t learn a thing from 2008, still focused in on subprime mortgages. 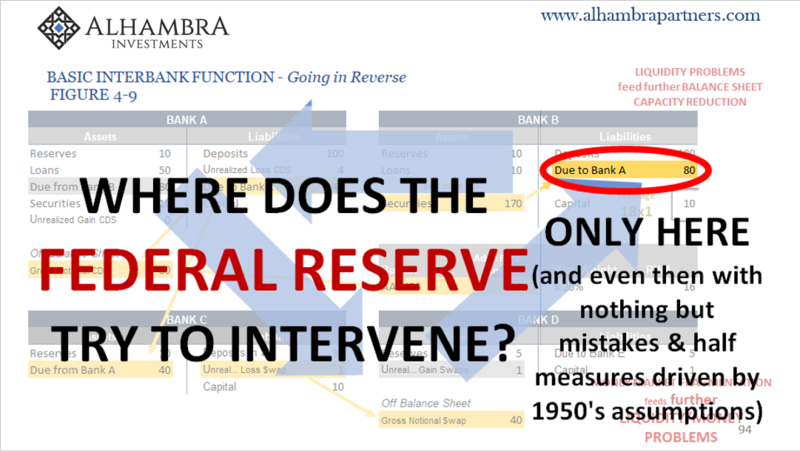 Thus, when central bankers do something what we do know is that intervention is taking place because something is wrong in the balance sheet construction process. Officials have a limited sense of something not right about the banking system’s money side output. All of our various proxies, including TIC’s US bank data, show that there is and has been a shortage of monetary inputs (dark leverage) leading to a shortage of outputs including money dealing. Rinse. Repeat. Nothing goes in a straight line, and each proxy (in addition to real-time prices) demonstrates the intermittent nature of the breakdown; eurodollar shortage leads to financial turmoil and then economic downturn, followed by brief and uninspiring reflation as the system waits to see if something has been fixed. That’s another huge blind spot, the system has no sense of itself. When everyone realizes nothing has, it’s on to the next cycle. This year, 2018, has been a revelation along those lines. Reflation #3 despite all attention to “globally synchronized growth” disappeared in the same way as the two that came before it. What’s left is Euro$ #4 and the selling UST’s that offer more compelling evidence of that fact. We all know what comes next, the self-reinforcing processes that constrain inputs now showing up across markets (curve inversions being one form). What we don’t know is how bad it could get at its worst point. Selling UST’s can help us decipher the probabilities for the same reasons; if central banks around the world are panicked into selling a lot, we can reasonably assume the malfunction is greater therefore the potential damage done by it.